At this time of year, Christians from around the world visit Bethlehem’s Manger Square to celebrate the birth of Jesus. This famous hilltop area has been a place of worship for people with a variety of religious beliefs. Bethlehem, located six miles south of Jerusalem, has been settled since at least 1400 B.C., when it was known as Bit-Lahmi (House of Lahmi). Scholars believe the name reflected a temple to Lahmi, the Canaanite god of fertility, located on a hill in the center of town. When the Israelites gained control of the area in perhaps 1200 B.C., they called the town Bet Lehem (House of Bread). Bet Lehem became famous as the birthplace of King David and the town from which the Jewish Messiah would come. At some point, after gaining control of the area in 63 B.C., the Romans erected a temple honoring Adonis, the doomed mortal lover of Venus, on the site of the Canaanite temple to Lahmi. After Christianity became legal in the fourth century, Helena, the mother of Roman Emperor Constantine, visited Bethlehem to find the location of Jesus’ birth, believed by then to have been in a cave. When local residents directed Helena to a cave beneath the temple of Adonis, Constantine ordered the temple destroyed and replaced with a church. The cave associated with the birth of Jesus now lies within the Church of the Nativity, built in 565 to replace the church built by Constantine. 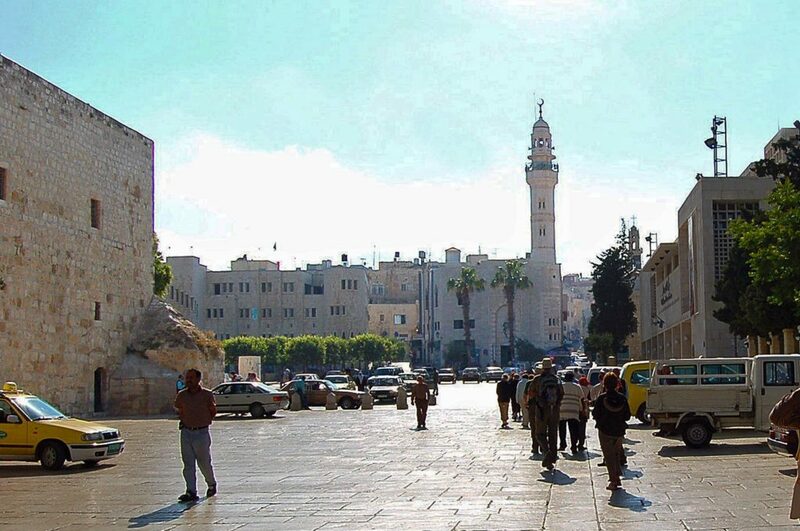 When Muslims captured the area in 637, they called the town Bayt Lahm (House of Meat) and erected a mosque near the spot they believed was the burial place of King David, who is mentioned sixteen times in the Quran. The current Mosque of Omar is at the west end of Manger Square, on land donated by a church.